Step away from the salad dressing! Unless it's light, and you measure out a 2-tbsp. serving, vinaigrettes can spell t-r-o-u-b-l-e. You might assume vinaigrettes are inherently lighter than creamy dressings, but that's not always true. Plus, while a serving is technically 2 tbsp., a more realistic portion size is 3 - 4 tbsp. 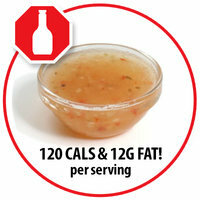 -- which means an average of 180 - 240 calories and 18 - 24g fat! To lighten up what's already in your fridge, thin it out with regular vinegar... and watch those portions! Better bets: Pick up some yummy flavored vinegars, like the kinds by Pompeian and Nakano. Or fill your fridge with low-fat vinaigrettes, like Bolthouse Farms and Newman's Own Light dressings. The back of the box shows you the calorie count -- not too bad. But let's be real: You know you're gonna eat at least half of that pizza. 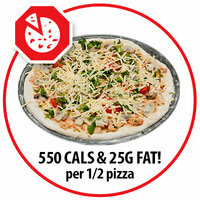 The above numbers are for standard pies, but don't think health-brand or thin-crust pizzas are safe. Scarf down half of an Amy's Cheese & Pesto Pizza with Whole Wheat Crust, and you're looking at 540 calories and 27g fat (SmartPoints® value 17*). Have half of a Red Baron Thin & Crispy pepperoni pie, and you just downed 585 calories and 28.5g fat (SmartPoints® value 21*). To make the most of what's already in your freezer, pair a single serving with a big salad... Just don't add regular vinaigrette dressing! Better bets: The easiest way to avoid this tempting conundrum is to buy portion-controlled pies. Lean Cuisine is one of our favorite brands. Dried fruit, veggie chips... Foods like these get a "health halo" because they're made from nutritious produce. But even the healthiest food in the world becomes fattening when you fry it in oil. 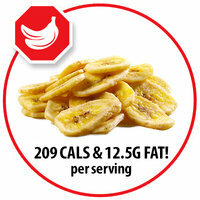 Banana chips are not only typically deep fried, they're also often sweetened with sugar. Just because you got them at your local natural-foods store doesn't mean they're a good choice. Better bets: Have you heard of freeze-dried fruit? Get familiar with it! It's rarely sweetened and never fried. Plus, the serving size is impressive, since it doesn't shrivel like ordinary dried fruit. The average 1/2-cup serving has just 50 calories or so. Check out Just Bananas -- parent company Karen's Naturals makes tons of different freeze-dried fruit options. P.S. If you're craving those veggie chips we mentioned, stick with our baked-not-fried kale chips. The biggest problem here is the portion size... that, and the assumption that bakery bagels are basically the same as packaged grocery-store versions. While bread-aisle bagels at the supermarket tend to top out at 3 ounces and 230 calories, the ones from bagel shops and bakeries typically tip the scales at 4 ounces and over 300 calories! And that's just for the plain ones. Wanna salvage what you already bought? Scoop out some of the insides -- or grab one open-faced half -- and top with guilt-free goodies. Better bets: Flat is where's it at! 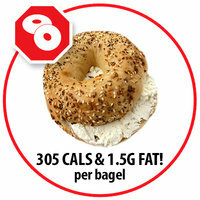 Stock up on thin bagels like the ones by Thomas', which have just 110 calories. If you can't find those, look for light bagels, like the ones by Western Bagel. We’re revealing TONS more edible imposters on our audio show. You CANNOT miss “The Food Fakers Episode” of the Hungry Girl: Chew the Right Thing! podcast... Click to listen NOW! HG Heads Up: There won’t be a Hungry Girl email this Monday; we’re off in honor of Labor Day. But we’ll be back on Tuesday with the carb-slashed Mexican meal you need! It's August 31st, a.k.a. Eat Outside Day. Summer won't last forever, so pack up this Italian Spaghetti Squash Salad and enjoy it al fresco! Make sure your pals are well informed... Click "Send to a Friend" to share!